Approximate Size: 10 - 35 Acres. Leash Rule: West half of park is Off Leash. Sandwiched between the Western Addition and the Lower Haight, this hilltop park in the historic Alamo Square district is best known for its postcard view of the row of colorful Victorians known as the “Painted Ladies”—one of which has the dubious distinction of being the house where the fictional Tanner family lived on the 80’s sitcom “Full House.” In fact, Alamo Square is ringed with classical San Francisco architecture, including the Archbishop’s Mansion and the gothic Westerfeld House, and offers an excellent view of the Beaux Arts dome of City Hall and the surrounding cityscape. The fact that this park is a regular stop for tour buses attests to its historical significance. And it’s an off-leash dog park too. Actually, only the western half of the park is off-leash, and from a dog’s perspective this park is probably nothing more than a solid bread-and-butter hangout. There’s a large sloping grass field and some bushes to check out, but that’s about it. Unlike parks like Buena Vista, Bernal Heights, Glen Canyon, and Fort Funston, which all have relatively extensive trails to explore, the main attractions at Alamo Square are the other dogs. And due to the density of the surrounding neighborhoods, there are usually a lot of them running around. If your dog’s social, and you enjoy historic San Francisco, this is definitely a park worth checking out. 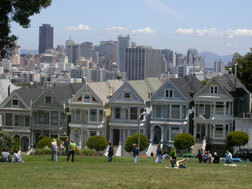 Alamo Square park is bounded by Fulton Street on the North, Hayes Street on the South, and Steiner and Scott on the East and West. Getting to the park is easy, but parking can be difficult if you drive. There’s no parking lot, but you can park for free on the streets that surround the park. Get there earlier in the day and you’ll have more luck finding parking nearby. As always it’s up owners to clean up after their dogs, and while there are several posts where you can pick up plastic bags it’s a good idea to always being a few of your own. Since this is a park where you are likely to run into a lot of other dogs, make sure you can control your dog at all times. See our “Dog Park Tips” page for more advice.